Having a window installer come into your home or work site should not be stressful. There are a lot of window installation companies, and you should have 100% confidence and trust in the company you pick to work on your property. Whether you are getting new home windows installed, or getting a window replacement, you can trust Goldfinch Brothers in Everett, WA. At Goldfinch Brothers we have start-to-finish Quality Assurance, so from the window showroom to the installation of the windows we will follow the same time proven process every step of the way. Since 1892 we have given our customers our full assurance that we will not only minimize the disruption to your home and lifestyle, but our window installers will work quickly and skillfully to complete the job on time. There are a lot of different scenarios to cover with your window installation service. To keep the matter simple, let’s assume you have visited the showroom, and have found some beautiful energy efficient windows that you purchased. Now, you want our window installers to finish up the project. Finding the exact size: The first thing we do is have one of our window installers visit your home to measure the existing windows and the rough opening (RO) to make sure the windows we deliver are the exact size for the RO. Tracking your order: We place the order with the vendor and track your purchase from point of manufacture to delivery to your home. Scheduling the installation date: Once the delivery date is established we will schedule the installation date. Be assured that our installers will respect your time and home when installing your windows. 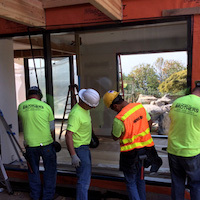 Before leaving the work site: Depending on the size of the package, it may take more than one day to complete the window replacement. In such a case, our installers will never remove an old window and leave a hole in your home. The skill and precision of our employees dictates that a one-for-one replacement be completed before leaving the site. Touch up for a precise fit: Our window installers will make sure your new energy efficient windows are square and plumb and operating efficiently. They may need to use a shim here or there or trim the RO to square it up. Sealed protection: When installing the windows, the installation will be water and air tight to further assure added energy efficiency. Gaps between windows and RO will be properly sealed and trim will be replaced as needed. Remember, your window project is the highest priority of our installers. They will respect your landscaping and yard as well as the inside of your home and give you their best efforts. Your project is a precious to us as the reputation of Goldfinch Brothers, Inc. Contact us today to find out how we can help your home or commercial window project go smoothly and stress free.